• Drilling mud is reused after separating the drill cuttings through shale shakers. • Produced water is re-injected to the ground after removing oil & grease and excess chlorides. • For unwanted and hazardous gases different absorbents/adsorbents, scrubbers and desiccants/molecular sieves are used. Remaining traces of gases are burnt as per international practice in the flare. On the more visible side, plantation of trees in our operating fields and plants is a routine measure to compensate the emissions from different activities carried out in the fields. Energy Conservation (Saving): Oil and Gas are major components of the Pakistan's Energy Mix as these are currently fulfilling more than 80% of the Country's primary energy needs. The Company is aware of the Country's needs for conservation to bridge the gap between energy supply and increasing demand. The Company has successfully installed permeate compressors after necessary modification in gas circuit to reduce tons of CO2-equivalent emissions due to flaring of gas from its Qadirpur Plant. Previously, permeate gas from the Qadirpur gas field was being flared resulting in large amounts of carbon emitted into the atmosphere without any use of the associated energy. The permeate gas is now being utilized in a modern combined cycle power plant in the private sector. The electricity so generated is supplied to the national grid utilizing the gas which would otherwise has been flared / vented into the atmosphere. In addition, being an ISO 14001 certified site, management has introduced various protocols to conserve energy in the process operations and other routine activities at Qadirpur. The major parameters include monitoring of fuel (oil / gas) and chemical usage / consumption and preemptively addressing / troubleshooting heating and cooling systems. Plans are being developed to ensure prudent utilization of these natural / energy resources at other key installations. 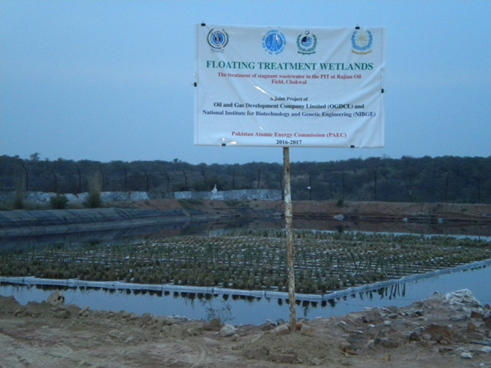 The concept of Floating Treatment Island/Wetland (FTW) technology has been applied at OGDCL. The concept was applied by OGDCL for produced water treatment/ disposal issues. OGDCL awarded the contract to National Institute for Biotechnology and Genetic Engineering (NIBGE) on no-profit no-loss basis to neutralize Rajian’s produced water in the contaminated pits. It is the first project of its kind of project in Pakistan and is about ten times cheaper than the conventional solutions. 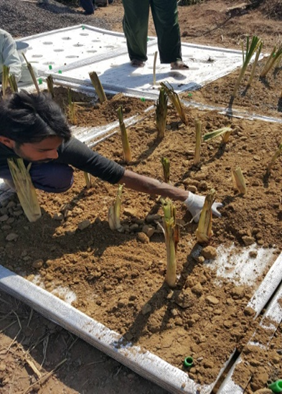 The project is underway and already has been applied to 6,264 sq ft floating treatment wetlands in one of the pit at Rajian oil field to improve wastewater quality. 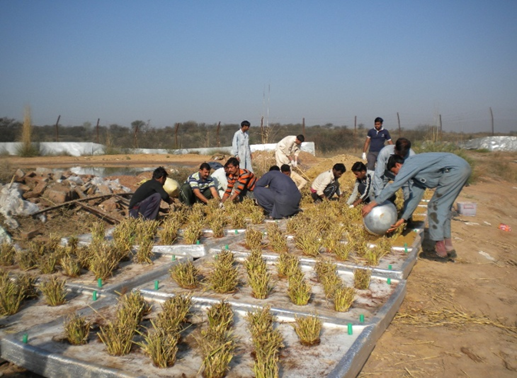 The design of FTW adopted at Rajian took into account specific plants capable of taking up organic and inorganic contaminants along with water through their natural processes in amounts that are significantly higher than what majority of the plants can tolerate. 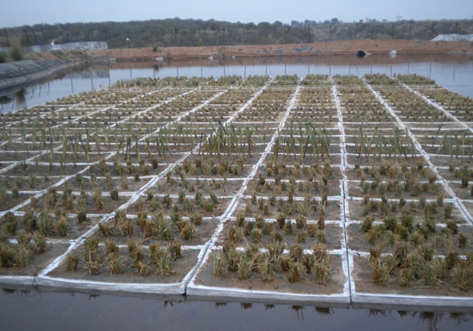 Cost saving is apparent as locally fabricated floating mats and indigenous plants are being used to develop FTWs. Moreover, specific hydrocarbon-degrading bacteria were inoculated to the plants to enhance pollutants degradation. The average biological remediation time is just six months. Another benefit for OGDCL would be the domino effect i.e. after successful application in Rajian, these developed FTWs can be easily be shifted in another contaminated pit or other location for remedial measures and hence save huge costs on recurring basis.